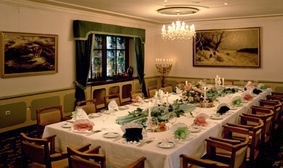 The hotel and restaurant are heritage-listed buildings located right in the centre of the cultural Moritzburg district. It locates at the immediate proximity of the famous Moritzburg castle, and is surrounded by an impressive forrest and lake district, at the outskirts of Drseden. The historic building, which belongs to the cultural heritage of the region, dates back to 1770. Our house is characterised by the the immediate proximity of pheasant castle, game reserve, light house and the famous moritzburg castle, which unite culture and nature. 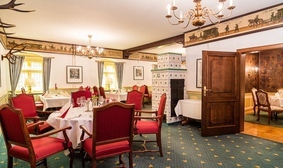 Our restaurant has a long tradition and is famous for its regional game and fish specialies as well as Saxonian delicacies (Our menu). Our wine cellar surely offers the right corresponding wine. The 8 individually designed restaurant and conference (events) rooms offer an exquisite ambience for private dining, festive events and business meetings alike. 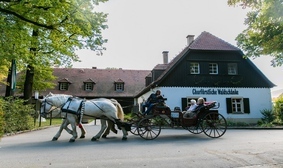 The Waldschaenke Moritzburg, situated in picturesque and calm surroundings outside Dresden, offers an excellent service for short trips and business travels, and has a unique and exquisite atmosphere. Relax and enjoy, while we take care of your well-being. If you are looking for something special in the Dresden area, please contact us. We are happy to assist you. You can choose from seven different room types for individuals, couples or for group bookings. Our restaurant has verious separate rooms and terraces in which you enjoy the same specialies. We offer our restaurant services throughout the whole day.